Recently I had a chance to interview the talented and prolific artist Steven Reddy about his new Kickstarter for his second book, This Is Then, That Was Now. 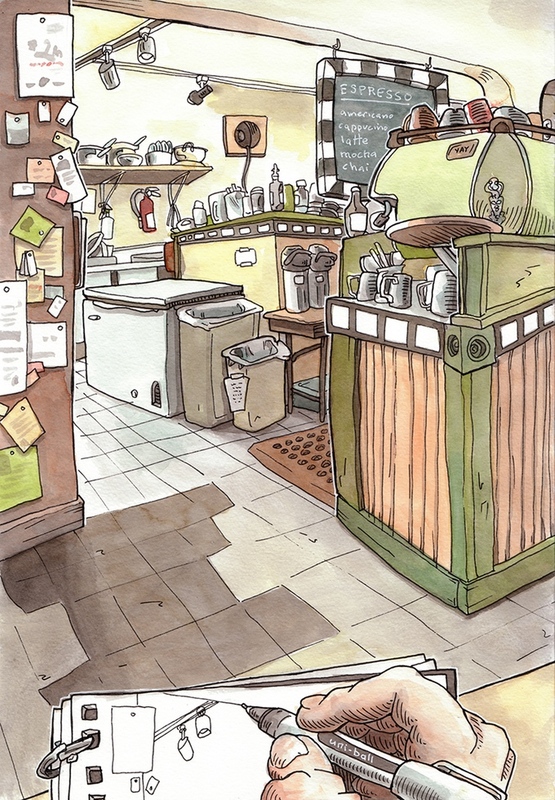 I’ve been really enjoying illustrated memoirs recently, and of course I’m drawn to watercolors of any type. He was kind enough to answer a few questions about the project, so I hope you enjoy this little treat! How did you get started drawing? I’ve always drawn. I was a quiet, well-behaved kid who read, drew, played instruments, etc. My mom and maternal grandfather had artistic aspirations and were encouraging. I was given oil painting lessons in grade school but I painted dumb stuff like too-skinny Snoopys and Halloween scenes of ghosts, pumpkins and black cats. I’ve never done well with formal training. Do you remember your earliest inspirations? I watched a LOT of Saturday morning cartoon growing up, and the cartoon influence- bold contours and clean colors are still visible in my work, which can be good or bad, depending on your assumptions about what “art” should look like. In preschool I learned to draw the Looney Tunes characters and the Kool-Aid flavor mascots: Jolly-Olly Orange, Rootin-Tootin’ Raspberry, Goofy Grape. It wasn’t until high school that I discovered, through album cover art, artists such as Roger Dean and Todd Schorr. I went through an Art Nouveau phase- Mucha posters and intricate floral-based designs. I won a juried art show and did my first commission work in high school in Anchorage- posters for plays, safety brochures and posters for the Alaska State Troopers. After high school I came across Robert Crumb and that group of more personal chroniclers. I’ve kept an almost daily sketchbook journal since my junior year, 1978. You teach Drawing and Illustration in Seattle– What was it that made you decide to pursue art and illustration as your “day job”? I stumbled across Danny Gregory’s An Illustrated Life in a bookstore here in Seattle, and it galvanized me. I had dozens and dozens of filled sketchbooks with no purpose, and suddenly this book showed me there were others with the same compulsion. I took a year to teach English in Jindezhen where I started posting my sketches of China to Danny Gregory’s flickr.com page, Everyday Matters. He saw my drawings and asked me to contribute a chapter to the sequel, An Illustrated Journey. I was going to be in the sequel to the book that inspired me! It happened so fast, it was surreal. I found your work through the “Everyday Matters” Facebook group–how do you suggest artists today approach social media? Are there any groups or platforms you’ve found to be particularly fulfilling? It’s important for artists to have an outlet, some release valve for all this work we do in relative solitude and anonymity, so being able to share on-line is motivating. 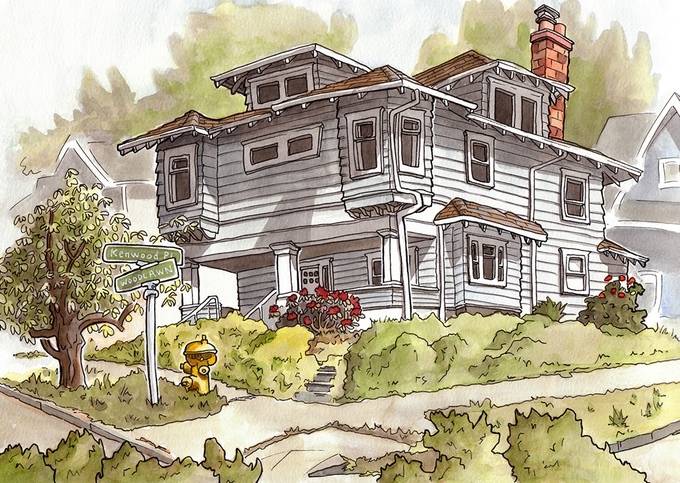 My “Big Three” groups are Everyday Matters, Urban Sketchers, and Artists Journal Workshop. Each group has its own specific manifesto, though, so you can only post certain kinds of drawings to each site. There are many more. Anyone can find the niche that fits their specific genre, subject, or materials. It’s exciting to see that you already have a successful Kickstarter under your belt. What did you learn from your first time around? Are there any particular techniques that stood out as more or less successful? The first time around was simple- I had 35 years of drawings already so it was only a matter of finding the book’s through-line, in my case traveling, and tapping into my networks for support. Miraculously, I was contacted just in time by a videographer who wanted to shoot a short documentary about my work, so we just turned that into my Kickstarter video. Serendipity! I met the Kickstarter goal in only two weeks and then, without doing anymore promoting, kind of coasted up to 140% of the goal. Printing a small number of books, especially huge, full-color art books like mine, is expensive though. After fulfilling my backer rewards, I had a few left over that I sold on Etsy.com for about what it cost to print and ship them. This time I’ve aimed quite a bit higher, hoping that as an established author with a track record of good reviews and having fulfilled all my backer rewards, I might raise enough to print more copies of This Is Then, That Was Now, and to reprint the first book, Now Where Was I? My videographer friend is now in film-making school somewhere so I shot the new video myself. It’s NOT a money-making venture for me. At least not yet. I have day jobs for that. I just want to share the work. What have been the most popular/effective reward tiers for you? The “Early Bird Specials”, where I ask for only the cost of printing the books, sells out the first day. Setting the cap on how many of those to offer is an art form I haven’t quite mastered yet. It’s a good way to get the ball rolling quickly, but then, at least in my case, it’s not really enough to pay for the books. I rely on the higher-end donors to make up the difference. I was gratified the first time around that backers were willing to pay $1000 or more to fly me to their cities to draw their homes for inclusion in the book. Although it sounds like a lot of money, after plane travel, hotels, rental cars, and meals out, I really just broke even. Still, it was fun to meet fans of my work. Super nice and encouraging folks in states I’d never visited before. For the current book, I’m asking for twice the amount of my first Kickstarter campaign. As of this writing I’m a quarter of the way through with a quarter of the goal met. So I’m on track but without the nice buffer I had the first time around. It’s pretty nerve-wracking. I go camping on the weekends where there is no cellphone reception just to give me (and my partner!) a much-needed break from obsessively checking the totals. After our initial interview, you took a huge look of faith and canceled the campaign, only to launch a Reboot immediately there after. 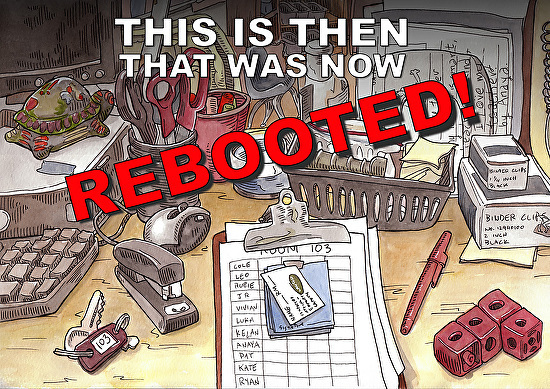 So what’s the story behind the Reboot? I’m an art teacher, and a lot of my students don’t have deep pockets. All of the “Early Bird” rewards were snatched up the first day and I wanted to make the book available to as many readers as I could. Kickstarter does not allow changing the details of a reward once someone has claimed it, because they’ve already pledged based on the description. The only way to change the rewards was to cancel the campaign and start over. I was a quarter of the way into the first campaign, with a quarter of the goal met, so I was on track to meet the goal. Based on the positive feedback of the first book, I had faith that my readers would pledge again to the revamped campaign. And why not? The same rewards were now available at a lower pledge level. It was win-win for everyone. I noticed that you mentioned turning away a publishing company. How do you deal with printing? Do you work with a local print company, or outsource things? My books are not like more typical sketching books. Most books about sketching follow a similar pattern: how-to, techniques for mixing colors, materials to buy, how to be comfortable drawing in public, inspirational quotes from other artists. There are some great books out there, but they have a sort of “Kumbaya” formula. Yes, art is meditative, gratifying, self-defining. But it can also be lonely, frustrating, and a battle between arrogance and insecurity. I want to put it all out there but publishers want what is familiar and marketable as a specific genre: travelogue or nature diary for example. The books I’m drawn to use illustration to tell a more personal, candid story about a specific life. My book is not a graphic novel, but I’m inspired by memoirists such as Alison Bechdel, Lynda Barry and Guy Delisle whose works are as much memoir and self-exploration as books of illustrations. What are the best ways you find to promote your work, especially since you’re going your own way without the help of a traditional publishing company? My first book sold out through word-of-mouth, and that was completely satisfying. No middle-man, no marketing, no pushing. I just said here’s my book and the reviews from Seattle to Singapore were all terrific and spot-on. I was proud of the book and happy that so many people found and liked it. I’m holding my breath on this new one. Wish me luck! This entry was posted in Uncategorized and tagged Art, illustration, kickstarter, steven reddy, that was then, that was then this is now, this is now. Bookmark the permalink.